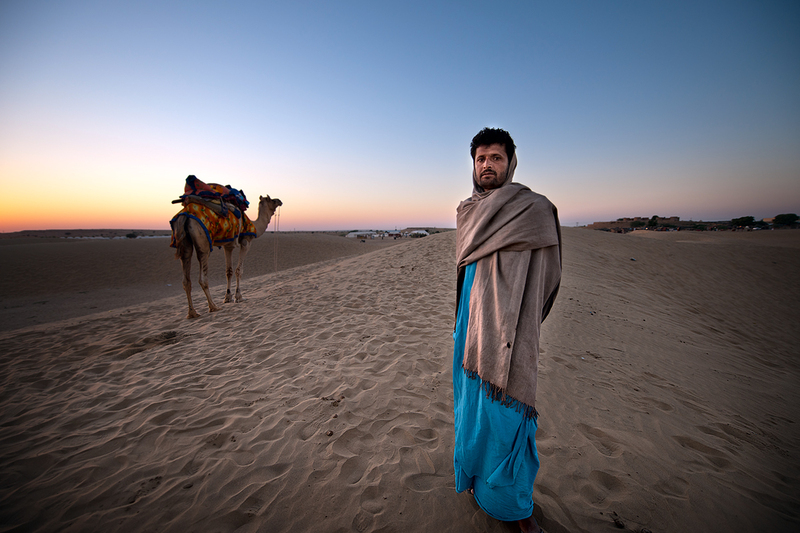 Doud Khan, has been a camel handler for the past ten years in Thar desert near Jaisalmer. Thar desert covers some 77,000 sq mi (200,000 sq km), it is bordered by the Indus River plain, the Aravalli Range, and the Punjab plain. Local economy depends mainly from tourism and sand dune safari's. Doud have to work at least twenty years in order to afford and buy a camel of his own. Jaisalmer is former principality also known as a "Golden city" of Rajasthan state, NW India. Its terrain is largely a sandy or stony waste and constitutes a section of the Thar Desert. Jaisalmer was brought under the Mughal empire by Akbar in 1570. It became a British protectorate in 1818. In 1949 the region was incorporated into Rajasthan state. The town of Jaisalmer was the capital of the former state. Now a rail terminus and strategic military post close to the Pakistan border, the town is noted for its massive yellow sandstone fort.